Friends of Symphony Park, in association with the City of Boston’s Edward Ingersoll Browne Trust Fund, to unveil “First Chair” by Boston artist Jacob Kulin: The artwork, a soaring 16 foot sculpture made of granite, Corten steel, cast bronze, and stainless steel, marks the completion of an 8 year, community-driven park transformation, tied to its musical surroundings. 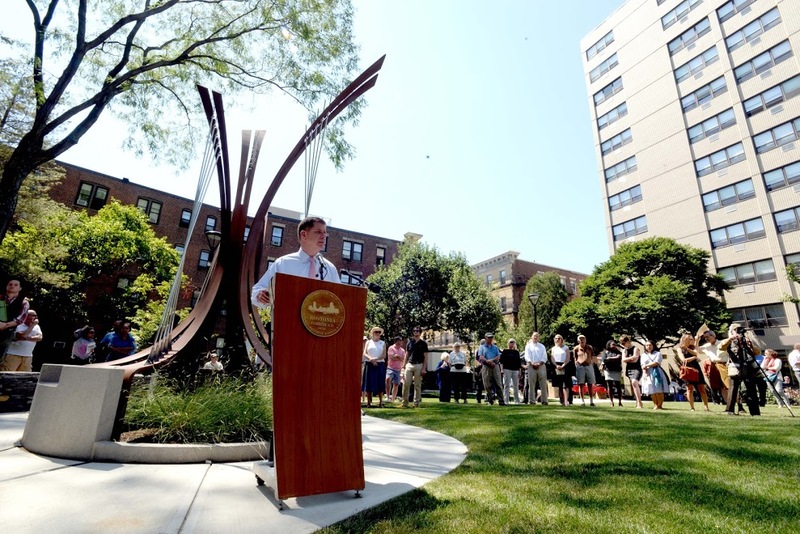 The Friends of Symphony Park have scheduled a public unveiling for a stunning contemporary artwork designed by award-winning Boston artist Jacob Kulin. Crafted from granite, Corten steel, cast bronze, and stainless steel, the sculpture’s arching forms evoke symphonic instruments and other musical elements, celebrating the connection between the park’s name and its location, steps from Symphony Hall. “There is a tremendous energy around the arts in Boston right now, especially public art that can be enjoyed by all,” said Julie Burros, Chief of Arts and Culture for the City of Boston. “The work done by the Friends of Symphony Park is a perfect example of how collaboration and partnerships can truly have an impact.” Kulin’s design was featured in a special place making panel discussion on the concurrent processes of landscape design and site-specific artwork at AD 20/21: Art and Design of the 20th and 21st Centuries in 2015. “First Chair” was created and partially funded by the Edward Ingersoll Browne Trust Fund, a public charitable trust fund managed by the City of Boston Trust Office available “for the adornment and benefit of Boston”, with support from the Boston Parks and Recreation Department and the Boston Art Commission. 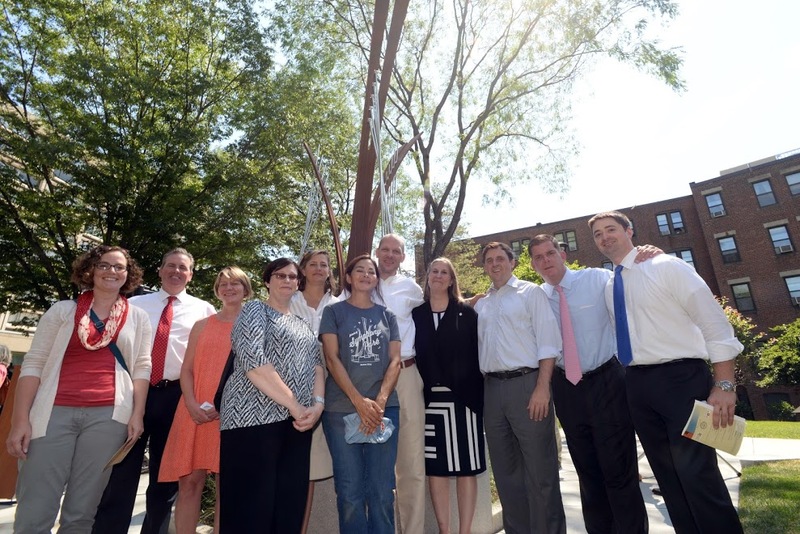 A special ceremony to mark the sculpture’s completion will be held at the park, located at Edgerly Road between Burbank and Norway streets in the East Fenway, Thursday, August 18th from noon to 1 p.m., and will include remarks by Mayor Martin J. Walsh, Chief of Arts Julie Burros, and Fenway Alliance Executive Director Kelly Brilliant, and will feature musical performances by classical musicians and Berklee College of Music. Sponsors for the unveiling include the Boston Symphony Orchestra and the Friends of Symphony Park. Mission Hill/Fenway Neighborhood Trust, Inc.
Jacob Kulin is an accomplished sculptor, metalsmith and furniture maker. A graduate of Skidmore College, Kulin received a Master of Fine Arts degree from Cranbrook Academy of Art. Today, he works on private, corporate and public commissions internationally ranging from smaller residential pieces to grand outdoor sculptures for commercial and public spaces. As a Boston-based sculptor of Danish heritage, Kulin’s longstanding admiration for Scandinavian design has influenced his creative pursuits. The interplay of materials like steel, bronze, glass, and granite, remain a primary focus in his work, incorporating precise fabrication, attention to detail, and a melding of materials. Kulin strives to integrate the perfection of nature into most of his works and feels a deep-rooted connection to natural forms. He believes a finished artwork must compliment a space, engage the viewer and leave a lasting impression. Kulin’s accomplishments range from sculptures for clients such as Royal Caribbean Cruise Lines and Viking River Cruises to corporate works for Wellington Management, Palomar Medical Tech and AstraZeneca Corporation. Most recently, Kulin completed a large public sculpture for the Massachusetts Port Authority at Boston Logan International Airport. His approach to public sculpture begins by understanding the desires of the client and having collaborative dialog with all agencies involved. He enjoys the process of learning about the space for which a sculpture is intended in order to fully understand and predict the visual and physical impact of the design. 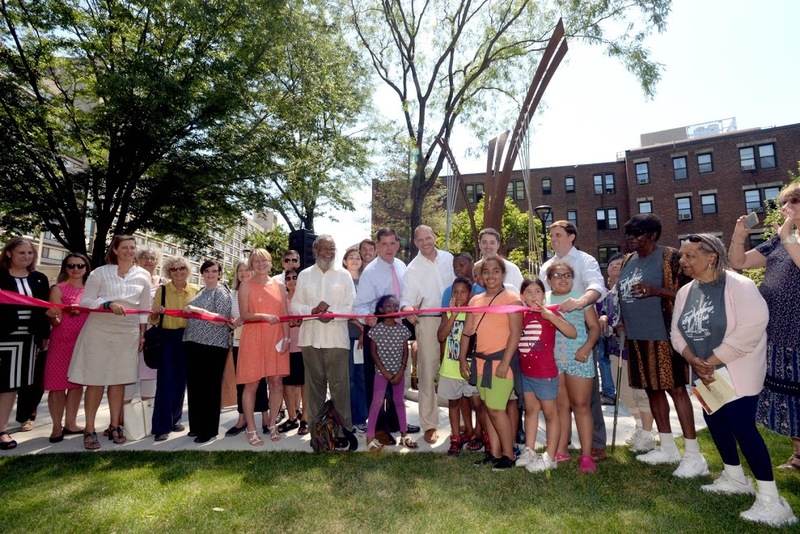 The Friends of Symphony Park are an all-volunteer organization, dedicated to the maintenance of Symphony Community Park in the East Fenway. 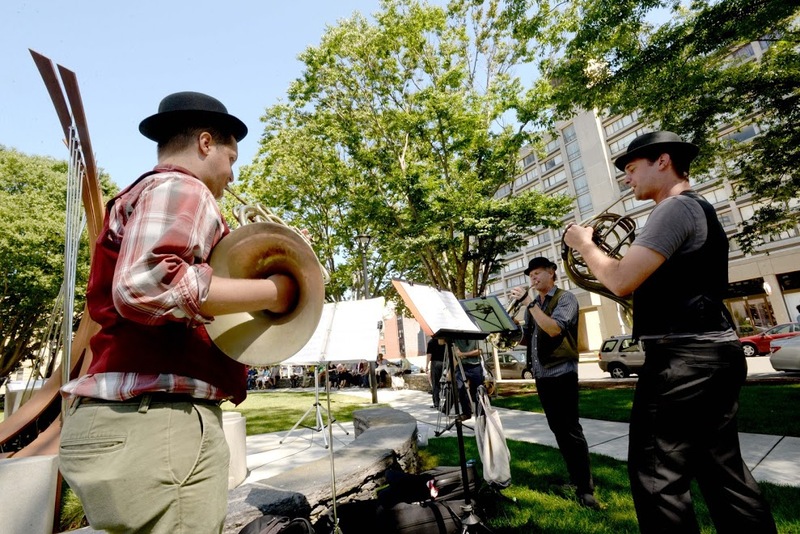 Their work has mobilized the capital restoration of the park, spearheaded a musically themed artwork, and facilitated 6 years of free park programs for residents and visitors. Symphony Park is located at the corner of Edgerly Road and Norway Street in Boston’s East Fenway neighborhood.